As well as the tablet issue, a second set was issued in 1293. The basic set in grey: for use at Kabul and Peshawar. Two plates, each with 24 stamps, one of all shahi types, and one a composite plate of all values. These are: Shahi (pos. 16); Sanar (pos. 21); Abasi (pos. 19); half rupee (pos. 16); and 1 rupee (pos. 12). 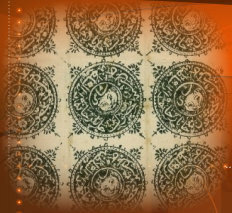 The stamps were alos printed in grey-green (to olive and brown) for use at Kabul; in brown, brown-black and possibly purple for use at Jalalabad; and in purple (often oxidised to brown) for use at Tashkurghan. Two shahi trypes (pos 7 and 23) cancelled by distinctive red stain and tear of Peshawar. Shahi brown, pos 20, cancelled by neat scissor cut and manuscript, indicative of use at Kabul. Sanar (pos 1) with cancelling tear on cover to India with Indian half anna to pay postage within India. Stamps in brown used at Kabul and Jellalabad. The brown-black stamps from Jalalabad are particularly hard to find, especially on cover. Shahi in brown-black used on cover from Jalalabad to Peshawar with the distictive Jalalabad cancel of a piece cut out of the stamp with blue ink then smeared across.